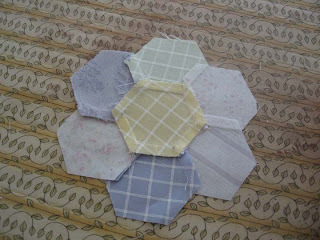 I had tried hand piecing hexagons and found it very relaxing and enjoyable. I did it so that I could try English paper piecing and I knew that my Grandmother had done them that way so I wanted to do it too. I saw other quilters do it so I had to do it too. I decided to see if I could piece them on the sewing machine and after thinking it through I gave it a go. I found a template that I had bought a while back and never used. 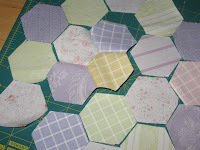 I cut out lots of hexagons with a rotary cutter (not scissors...gasp!) from some Charm packs that I had of April Cornell fabric. My template had a hole at the quarter inch seam that I used to mark the corners. I laid out all of my pieces for the hexagon flower I was going to piece for a pin cushion. 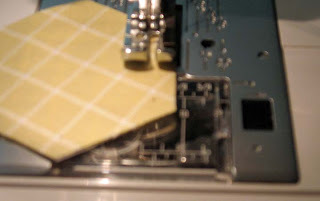 I started with the center block and put right sides together, marked the two corners that I was going to sew to and from, put the needle down right on the marked dot and sewed to the next dot. Next I picked up the next hexagon and continue marking the corners as I went, to save time I marked the corners that I needed to as I went. 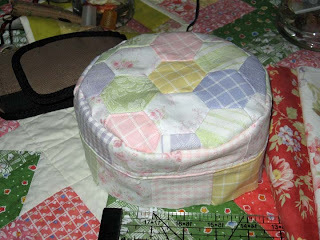 When I got to a 'Y' seam I folded the center hexagon in half to move it out of the way of the stitching. I did have to do a lot of concentrating on which way the seams needed to be folded, but soon I was on a roll. After I got the first ring done I ironed all of the seams around the edge in one direction and then ironed the center hexagon out. This method layed out very nice and flat. I put one more ring of hexagons on to the outside of that. The project that I was making these for turned out to be a bit larger than I was anticipating. It is a pincushion that measures 6" across. 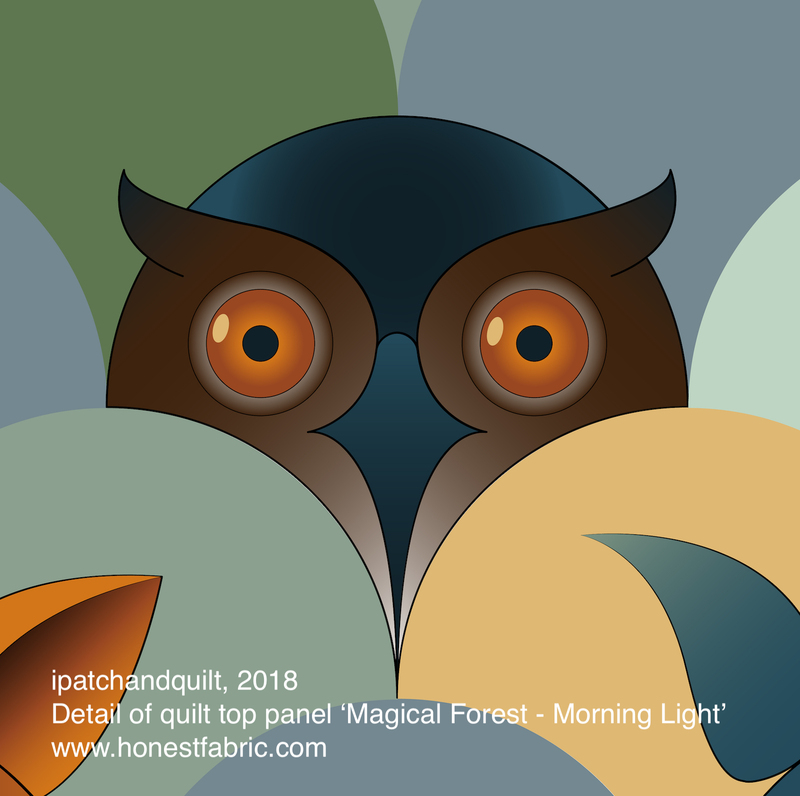 I found it on the Moda Fabrics Free Patterns page. I haven't finished it yet because I was thinking of a way to make it smaller, but decided that a large pincushion could be quite useful and I am liking the way it is turning out. I have chosen not to add the prairie points that the pattern calls for. 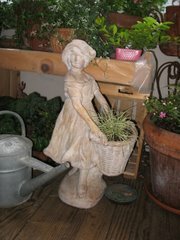 I will stuff it with walnut hulls and lavender with a little batting in the center. I'm not sure which is the best way to put together hexagons, but I found this to be simple enough with a little thought and I think it saved some time. 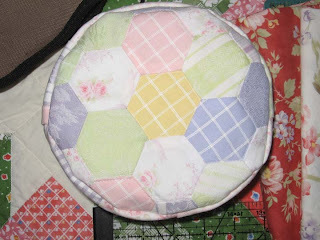 Hand piecing hexagons does make for a nice small project that you can take anywhere and hand piecing 'Y' seams might make them a little less intimidating, but I did find the machine method to work out well for me and I had fun trying! While wondering "Why?" I found a new project and an answer..."why not!?" Very nice!!! You did a great job. I like the fabrics you chose for this project! I have never done any hexagon projects. 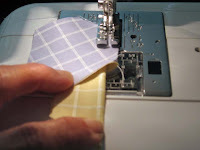 I do see there are a lot of bloggers in some sort of Great hexagon sew- along club.Are you a part of this? It's wonderful to hear from you. Thank you for helping me name my quilt. I am just amazed at the creativity out there in blogville!